Thomas Clifton - a ghost from the past. Writing in Scenes from Sutton’s Past, Jim May described Thomas Clifton as “a decent, sober, hard-working man”. This opinion was based solely on Clifton’s probate records - his will and testament, and the valuation of his household goods made after his death in 1684. His “Dear wife Elizabeth” is made the executrix of his will, and his dyeing and shearing business is left to his “dear son Francis”, but such expressions could be matters of form rather than genuine affection. It appears from the will that his six grown-up children all had their own establishments - one of his daughters was married, and his youngest son John, aged 21, became be Warden of Sutton Coldfield in 1710. Thomas Clifton’s household goods are listed room by room, and the only downstairs room is the kitchen - no doubt other rooms in the house were occupied by tenants. The kitchen contained, in addition to all the cooking utensils, a screen, a table and bench, chairs and cushions, brass and pewter candlesticks, and a looking glass, so it must have doubled up as a living room. Also listed here are some books and a desk, so perhaps the kitchen was also used as the office for his business. There were three upstairs rooms. The one above the entry seems to have been a spare bedroom, while the one above the workshop contained spinning wheels and a large quantity of wool and yarn. The best bed was in the room above the kitchen, which was also a sitting room to judge by all the furniture there. At this period, furniture was made of oak by local carpenters, the most elaborate piece being the four-poster bed with its curtains and overhead valence to protect the sleeper from anything nasty falling down from the thatched roof. The heavy furniture was softened by cushions and a tablecloth, and there were two Kidderminster carpets, probably used as wall hangings. Although most of the furniture was crude by later standards, it was plentiful compared with the few items which would have been found in a similar house 100 years previously. One item of furniture which seems to have been in every house - there were six in Clifton’s bedroom - was the “joint stool”; two seventeenth century oak joined stools are still in use in Sutton Parish Church. Thinking about Clifton’s possessions, an idea of the man begins to form in the mind, and the late Jim May was haunted by a strong feeling for Thomas Clifton - at one of our meetings he proposed a toast to “absent friends”, meaning the seventeenth century Suttonians whose probate records he had studied. 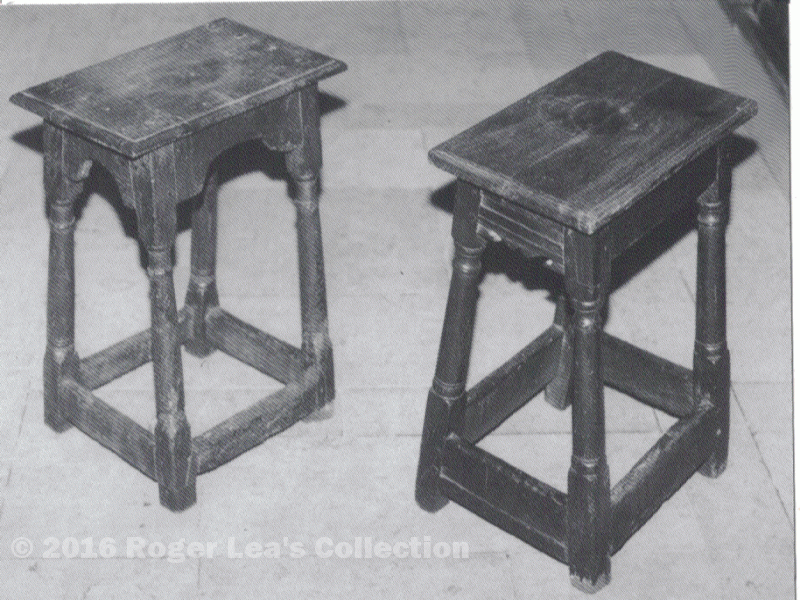 Seventeenth century joined stools - these two are in the Parish Church, usually used as stands for flower arrangements.